Marie-Pier Beaudette of Les Stentors, Sherbrooke, QC, Canada, sent in this shot. "Last year was my fifth drum corps summer with the same Division III (Les Stentors) corps as a mello or soprano player. 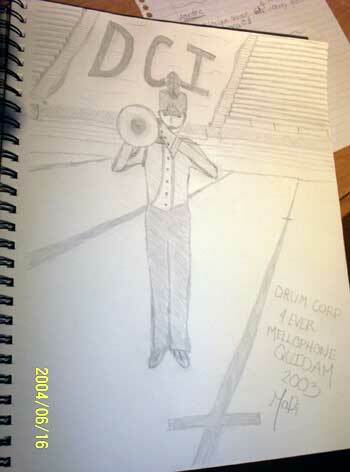 This is a picture of a drawing I did to commemorate last summer, the best summer of drum corps I ever had. "I have many souvenirs of this memorable year, and the artist in me wants to put them on paper. "The drawing represents me on the DCI field, with the uniform of Les Stentors, and of course, my mellophone." Thanks Marie-Pier!